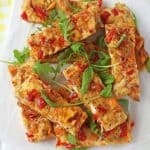 For a delicious, filling and healthy lunch try these Sweet Potato Frittata Slices. Super easy to make! Preheat the oven to 180c / 390f and line a baking dish (I used a 25cm / 9.5 inch square baking dish) with parchment paper. Cut the sweet potato into small cubes and transfer to a large plate. Microwave on high for 5-6 minutes until the sweet potato is just about cooked and soft. In a large jug or bowl add the eggs and whisk. Mix in the cheese, flour and herbs and season to taste with salt and pepper. Transfer the sweet potato into the baking dish. Chop the red pepper into small pieces and sprinkle on top of the sweet potato. Pour the egg mixture on top and bake in the oven for 15-20 minutes until the frittata is cooked through. Allow to cool for at least 10 minutes before cutting into 12 slices. This will help the frittata slices to keep their shape. The frittata slices will keep covered in the fridge for up to 2 days.